A 77 year-old woman, requiring intubation and mechanical ventilation (Servo S - Maquet) was on VCV mode with "ramp wave" format flow. Sensitivity: 2l/min. Diagnosis: Septic shock, but stable arterial pressure. Sedated: RASS score: -4, no signs of pain. What would you do about the patient-ventilator asynchrony? The curves below, show two types of asynchrony: patient's flow demand unmet by the ventilator (shown on the first top image) and one double triggering (shown on the second image). Changing the ventilator mode to PS could indeed improve synchrony on this particular situation. However, the patient was still in deep sedation state to safely use this approach. Increasing inspiratory flow on the VCV mode and also changing the flow profile from decelerating ramp wave to square wave format would be an interesting option, but this may not solve the problem, due to the inspiratory time reduction that can happen in the case of maintenance of the peak inspiratory flow. In this particular instance, both the inspiratory flow and the inspiratory time would need to be increased. By switching to the PCV mode, the patient-ventilator interaction improved quickly, in a few minutes, with a reduction of abdominal muscle work. The MV curves also improved, with no double triggering and no signs of unmet flow demand. There was a slightly VT increment: from 300 to 320-330ml, in fact a price to pay or this alternative setting. 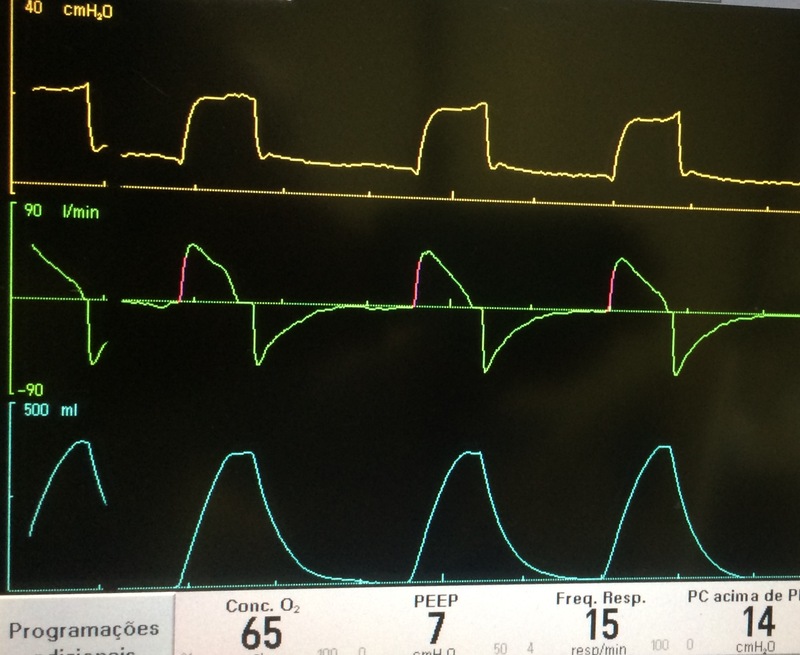 On PCV mode in this particular case, the inspiratory peak flow had good interaction with the reduction of inspiratory muscular effort, which provided a greater comfort and reduction in the patient's respiratory drive. There was no need for administration of additional sedatives or neuromuscular blockade, options that were initially considered by the ICU team. That's it! See you in the next challenge! Acid-base disturbance and problems with respiratory mechanics in a heavy smoker during controlled MV.